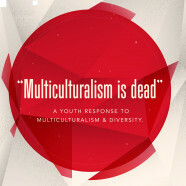 “Multiculturalism is Dead.” Or is it? Nicolas Sarkozy certainly believes it is, and David Cameron has claimed that it has failed. Do the young people of today’s Britain agree? The youth-led organisation Interact are giving young artists aged 18-30 a platform to express their views on these controversial political opinions. From Indian to Irish, UK natives to international migrants, these artists will discuss whether they believe multiculturalism exists by reflecting on their own personal experiences on cultural diversity and integration. This exhibition, in partnership with the British Council, will reflect on the current status of multiculturalism in the UK and in Europe more widely. The exhibition opens on the 14th of March from 6pm-9pm. The event is FREE and all age groups are welcome, with nibbles and drinks available. If you can’t make it on the 14th, then the exhibition will be open daily from the 15th-20th of March. Our First Thursday preview will display a series of works, which have been made in collaboration with three London-based professional artists. Thirty young individuals have taken part in a workshop and created pieces, which visually express their feelings towards the theme. Working in mosaic, screen-print and photography, this series will introduce the topic of our theme in preparation for the full exhibition opening on Thursday the 14th of March.